"Ultimately, having instant access to vetted information can be a major factor in patient outcomes. The resources available on AccessMedicine are invaluable to a medical clerkship student in diagnosing and managing SLE and other complex disease processes. 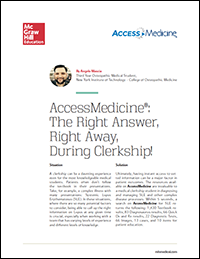 Within 5 seconds, a search on AccessMedicine for SLE returns the following: 1,430 Textbook results, 83 Diagnosaurus results, 66 Quick Dx and Rx results, 22 Diagnostic Tests, 66 Images, 13 cases, and 10 items for patient education."